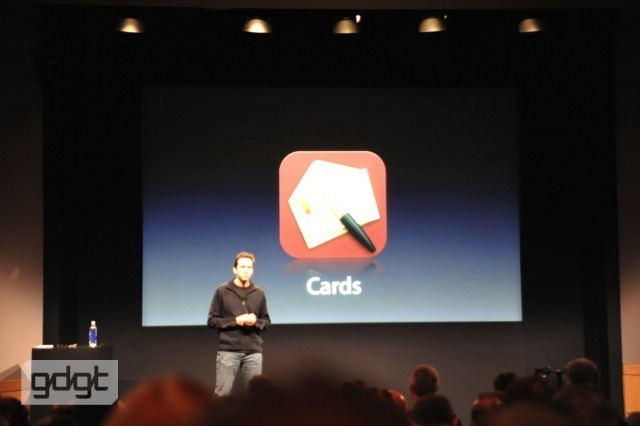 Scott Forstall is onstage at the Apple media event right now introducing a new iOS app called “Cards” that allows you to “create and mail beautiful cards right from your iPhone or iPod touch.” It comes with over 21 template designs for greeting cards. Interestingly, Apple will provide you with high quality prints of your greeting cards mailed to you on 100% cotton paper. You’ll even get a push notification when the greeting card is delivered. The app will be available free on Oct. 12th with prints going for $2.99 in the US and $4.99 elsewhere.